Forum Index > Historical Arms Talk > Sallet design. Posted: Sun 03 Dec, 2017 1:55 am Post subject: Sallet design. 1) To people's knowledge are there recorded cases of sallet design like the one I have pictured above? 2) What tips and advice can people offer for trying to forge a split helmet, and how easily can this be done without heat? I just did an image search, and saw several examples of a sallet that seems to have the bevor permanently attached to the helm, much like your design. I'm not about to link them...image copyright laws. Forging one without heat would be VERY difficult, in my opinion. With regard to making said sallet, my main issue is that I don't have space for a forge. I could probably get away with keeping a dishing stump, and some other simple tools for helping to raise the two helmet halves, but not a propane or coal forge.... Welding them together shouldn't be a problem, and while I understand this isn't an accurate way of making a helmet, I've seen people say that making it in two halves is actually feasable without a forge. I have also wondered about buying a blow torch and using this to heat small areas of the metal at a time, but I don't know how feasable that is.... Anyone tried this? 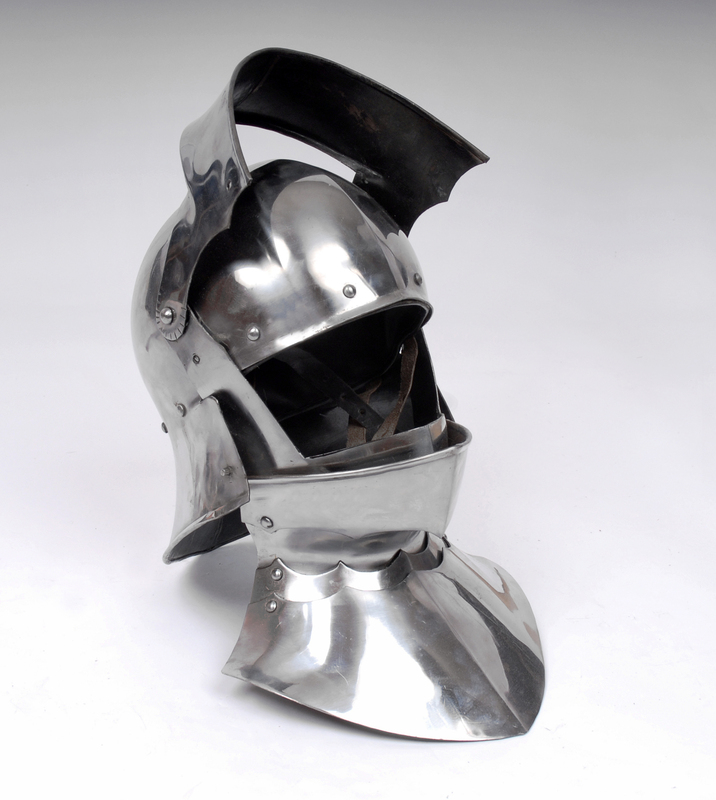 The link has pictures of several museum pieces that have falling-visored sallets. I've seen no arguments that use of a falling visor is an ahistorical method of sallet design. A search for "visored sallet" or "gothic sallet" should lead you to many modern and historic examples. As for the bevor, my sallet/bevor combo uses a "falling buff" bevor - the visor on the helmet lifts, the buff on the bevor lowers. If made properly, the bevor, like any other piece of armor, will provide protection without impeding movement - just think of it as a gorget with a chin-cup (which is what it is). It doesn't hold your chin in place - there's plenty of room to turn your head if it is made correctly. If fastened correctly, it remains stationary while your head and sallet move. As for "complicated", I'm not an armoror, so I don't know how difficult it would be to make one; but, if you're skilled enough to make the visor and helm, you are likely skilled enough to make a bevor. Ahistorical, but also an existing design/SCAism due to the annoyance of a bevor and various HEMA group rules about helmet gaps and the like. Darksword armory has been importing something similar for quite a long time. I would say that a great many of modern day production helmets are made in two piece construction, with the exception of some great helms. These would be made with more than two pieces. I've got a friend who is a tree surgeon, he says he's got a large enough log piece lying around I can take... interestingly enough as I recall, my neighbour had this piece of railway track in his back yard. Though I think it was a very piece far too large to move around, and I'm not sure how best to cut it. Nor am I particularly sure he'll be willing to relinquish a section, but I can hope.... I'll ask him at so be point this week. All you would really need is a piece about 10 or 12 inches long. Cutting it might be a chore. Would probably require a hand-held chop-saw with a metal cutting blade----and a cutting torch. The chop-saw I refer to is the kind that is basically a gas-powered chainsaw with a big, metal-cutting disc/wheel. They are used in underground utilities work for cutting pipelines and conduit. Lord knows, I've been on the working end of one more than I care to remember. Sallets can be quite tricky to make. definitely go for a two piece with a weld down the middle. A raised sallet from a single sheet of steel is a much trickier project. What do you want the sallet for, looks or contact fighting? For looks (and some protection) you might get away with using 16ga, 1.6mm sheet mild steel. A contact version you might need to go 12ga, 2.5mm. A propane/ oxygen set up with a heating tip and torch will be handy to anneal the metal to stop work hardening, and also allows you to work the metal hot. When working hot only work the steel whilst its still red hot. If you let it cool down too much it becomes weak. Either heat it up again or wait for it to cool down back to ambient temperature and work cold. In my experience the bevor is essential for the salet to function properly, almost like upper and lower halves of the same unit. I wouldn't worry too much about a lack of movement, I've fought in a bevor/salet combination and it offers much more articulation about the neck than a lot of other contemporary helmets. The only helmet I can think of that's more comfortable and maneuverable with a bevor is a kettle hat. As previously mentioned later salets subvert this problem by becoming more complex and enclosed e.g in the case of the bellows face. However depending on your needs/period of interest this could be too late, as well as the fact that the salet you've designed is representative of the vast majority of historical examples, even visorless salets are more common in later periods than bellows face examples. Posted: Tue 05 Dec, 2017 2:44 am Post subject: Re: Sallet design. As for second question, you "might" try with an english wheel. It takes as much training as forging and it is probably costlier, since an old anvil, couple stakes (self made often at zero cost) and a simple DIY coal forge would be very affordable. I recently used a stump and inexpensive English wheel from Harbor freight to make a gas tank for a bike cold. It was my first serious attempt at using these tools and have been a little intimidated to even start. But i was surprised how fast and easy it actually went and began to think i could make armor with this thing! Although it was only 16G mild steel sheet, i’m sure thicker and or harder alloy would be much more difficult to work with a cheap wheel. I will post pictures if you wish? much as I'd love to try using an English wheel for something like this, and it looks like a fascinating piece of kit in general, i feel like a propane torch, hammer, and some sort of anvil is more the way to go when it comes to pricing. I also came across a propane bottle in my shed yesterday, and thought I could turn that into a forge with an angle grinder and a few bits of pipe. (In fact, there were two, so I could cut one laterally, for making longer, larger items, and one vertically, for heating discs, such as helmets) Would certainly make for a good summer project.